August 9: Forty Yemeni boys and eleven adults on a school bus were killed by a laser-guided Lockheed Martin bomb. Two weeks later, twenty-six more Yemeni children and four adult civilians killed by US bombs in Saudi air-strikes. Maybe you’ve heard recently about the humanitarian disaster in Yemen on mainstream (capitalist) US media. It’s been going on for three years. You probably didn’t hear when the Israeli government, also using US bombs, massacred over 500 children in Gaza four years ago. Why now? 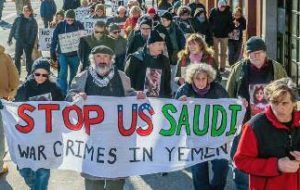 Why are the US media and some politicians pushing back against US-supported Saudi war crimes enabled by multi-billion $ US arms deals in both the Obama and the Trump administrations? Part of the answer is an August 28 UN report accusing both sides in the Yemeni civil war – but especially the Saudi-led coalition – of war crimes. Another part is that US imperialism benefits more from instability in Yemen than it would from a decisive Saudi victory. Its Chinese competitors are strengthening ties with the Saudi rulers. They’re the ones that stand to gain the most from a stabilized Yemen. Meanwhile, Yemeni children and adults die. They die from bombs. They die from starvation. They die from cholera and other preventable diseases. In short, they die from capitalism. And it’s not just in Yemen. The answer, as we said then, isn’t another “peace” movement. 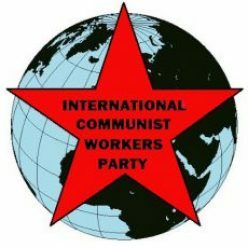 It’s to join and build the International Communist Workers’ Party. Why NOT now? Contribute in whatever way you can to hasten the end of this capitalist hell on earth. Do your part to mobilize for a communist future for all our children everywhere!